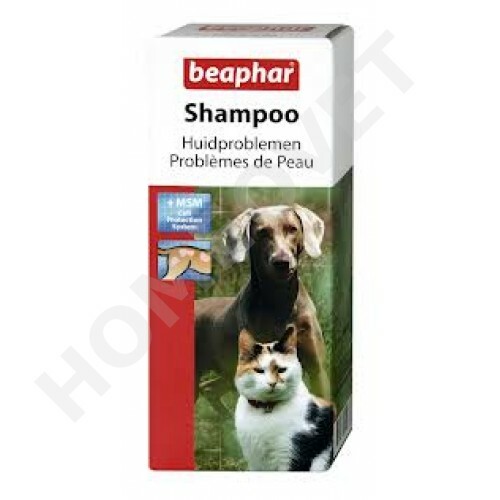 The Beaphar Shampoo for skin problems has been specifically developed for dogs and cats with sensitive, prone to skin problems. Mild ingredients such as birch tar gently cleanse hair and skin and contribute to the regeneration of damaged and brittle hair with. * MSM methylsulfonylmethane) strengthens resistance and helps to maintain the natural balance of particularly sensitive skin and hair with. Shake well before use shampoo. Make the fur wet with warm water and massage the shampoo well (until it foams). About 2 - 3 minutes leave on, then rinse very well. If necessary, repeat the process. Anschliesßend dry the skin thoroughly.